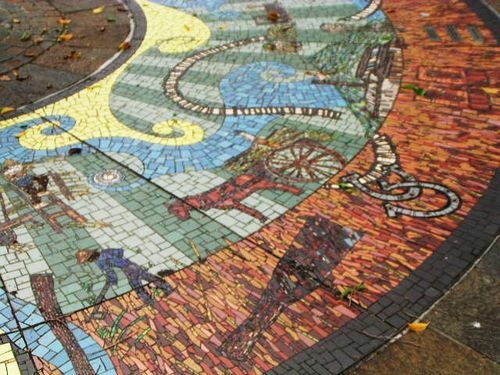 A mosaic surrounding the cane farmer statue commemorates one hundred years of the sugar industry in the area. The first Mulgrave Mill crush of 13,973 tonnes of cane was from October 1896 to March 1897. The rate of 1,500 tonnes in the first month bears little comparison with the current rate of 450 tonnes per hour. The Mill was established under the Sugar Works Guarantee Act where the landholders mortgaged their lands to the government as security against the mill loan. The Mulgrave Tramway was operational for the second season and continues as the efficient mode of transport for cane to this day. Of The Sugar Industry In This Area. To The Sugar Industry Of Far North Queensland.
" A PROJECT OF THE FRIENDS OF GORDONVALE"